Standing Forward Bend or the Uttanasana yoga is from the standing forward folds group of postures. This asana closely resembles the Hands to Feet pose or the padahastasana with the sole difference in the positioning of the hands. The posture is well-known for its soothing effect and relief on the nervous system. The Uttanasana Pose could be found in the second or third step of the classical Surya Namaskar yoga sequence. 1. Placing your hands on the hips, stand in Tadasana. Place your hip joints and bend down from there, instead of the waist. Emphasize on elongating the front of the upper body, drawing it out of the groin and maximizing the space between the pubis and the sternum. 2. While it can be a test of flexibility doing Uttanasana for beginners, try not to touch the floor with your palms and fingertips without buckling the straight knees. You can either touch the floor in front of you or the space to the sides of your feet. Alternatively, in order not to over-try your flexibility and bring injury, you can clasp your ankles by bringing your palms to the rear of your ankles. Yet another variation- cross your forearms and clasp your elbows! 3. Press down heavily with your heels into the floor, pick up your sit bones facing the sky and rotate the inner upper thighs to the inside. 4. To engage deeper and really move into the pose, lift and stretch out the front torso with each inhalation. Reserve the exhalations to release and deepen the forward bend with the exhalation. This way, you will find a rhythmic, oscillatory movement of the torso with the rhythm of the breath. The position of the head should be between the shoulder blades, hanging loosely. 5. At the time of release, bring your outstretched hands touching or close to the floor back up on the hips. the length of the front torso is now reaffirmed. Now, take a deep breath in, thrust your tailbone into the pelvis, and roll your torso slowly up with the inhalation. Note: Uttanasana steps and benefits are often recognized for the characteristics of a resting position. Therefore, it could be featured in a long sequence of standing postures, though standing forward bend is also performable as a singular posture. The stretch of holding in the bent pose is ideally 30 seconds to 1 minute. A Wide-Ranging Stretch Effect– The down way fold pulls at the hips, hamstrings, and calf muscles. The thighs and knees are thus toned and strengthened. Also, you get to undo the knots in the spine and relax after a long day of sedentary work. Anxiety Alleviation– The head-downer natural rushes a lot of blood to the head, oxygenating and relaxing the mind-control muscles sufficiently. It also sets the nervous system into a soothing note. Abdominal Muscle Activation and Stimulation in Parts– The bend down and stretch hit the abdominal muscles directly. So it’s not illogical to expect your digestive tract receive a relieving massage in the process. The stomach space constricts and eases up, sending things in a churn, the kidneys, liver, and spleen are stimulated, and overall digestion and metabolism hikes. Only if you know how to engage and activate the right set of muscles, the uttanasana yoga steps and the many variations of the standard standing forward bend, can get much intense. This posture is at once, a transition stance and a posture of taking a respite between movements, poses, and sequences. The five most-valuably regarded Uttanasana Yoga Pose variations have a unique set of benefits. With Belly Contact and Reasonable Knee-Bend– The standing goes the same, with the two feet set hip-distance apart and for the sake of ease, slightly bent at the knee. The upper body folds smoothly over the legs in a way that the belly comes in touch with the thighs. The more bent knees are, more will this be possible. Your neck and head, at this point, hang loose and relaxed. The arms now hang down, touching the floor. The belly touching the thighs and the bent knees make the pose more relaxed though equally absorbing. The lower back really un-knots and breathes. Grab Elbows to Release a Stiff Upper Back– The usual Uttanasana standing is what we begin with. Whether you are keeping your foot touched together or apart, is your choice. Fold down and let your head and neck hang loose. In this Uttanasana variation, you will do a different thing with your arms. Bend your arms and grab the opposite elbows with your two hands. The sheer weight of the arms will stretch your shoulder blades solidly, pushing them closer to your thighs. In this variation, it is actually your stiff upper back muscles that get worked. There is a push-pull play of forces going on in the back with the arms weighing down and the neck gently holding the head up. Prayer Hands to the Back– Start in your usual Uttanasana pose and fold forward, remaining relaxed and mindful in the stance. Now, draw up your shoulder blades in a solid ‘T’ shape. Draw up your hands together, creating the prayer hand gesture. Feel the gesture pulling at your side-spinal muscles. Turn the joined hands with the fingers pointing in your face. Turn the arms in that hand posture to the back, behind your neck. Performing the uttanasana posture can be a menace and best avoided in cases of—back injury, abnormal blood pressure, and late pregnancy. In some of the above case, it might help to perform the Ardha (half) Uttanasana with bent knees and wall support. Consult your doctor to confirm. 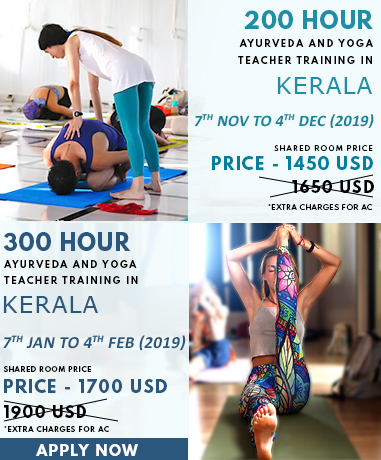 To know about Uttanasana in further detail, explore our Yoga Teacher Training In India.